In Anna Selander’s project “Between You and Me”, portraiture becomes a relational exercise. Whereas in most cases there is a clear separation of artist and subject, here the balance of power is equal. Who portraits whom and what do the images reveal? Each drawing is juxtaposed with the photograph of the artist, taken by the portrayed subject herself. This project reveals surprising insights on relationships, authorship and projection. 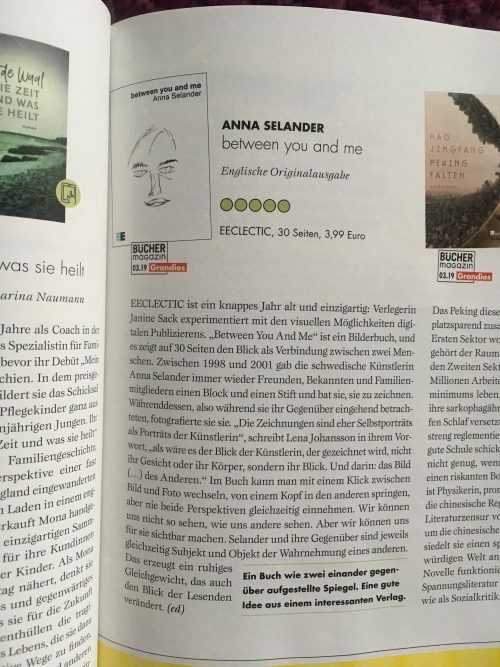 In Anna Selanders Projekt “Between You and Me”, wird das Portrait zu einer Beziehungsübung. Während normalerweise eine klare Trennung zwischen Künstler und Subjekt besteht sind hier die Machtpositionen gleich. Wer portraitiert wen und was verraten die Bilder? Jeder Zeichnung steht das Photo des Künstlers gegenüber, photographiert vom Model selbst. Dieses Projekt enthüllt Überraschendes über Beziehungen, Autorenschaft und Projektion. Anna Selander is an artist and art pedagogue based in Stockholm, Sweden. She was educated in École Nationale Supérieure des Beaux Arts and IHEAP in Paris. She has been working mostly in the field of photography and video. Her work is often collaborative and interactive. For several years Anna has been working as a tutor at Atelier Inuti with artistically talented individuals with intellectual disabilities and individuals within the autismspectrum.